Originally introduced with an engine-turned dial last year, the Breguet Classique 7147 gets a grand feu enamel dial this year. 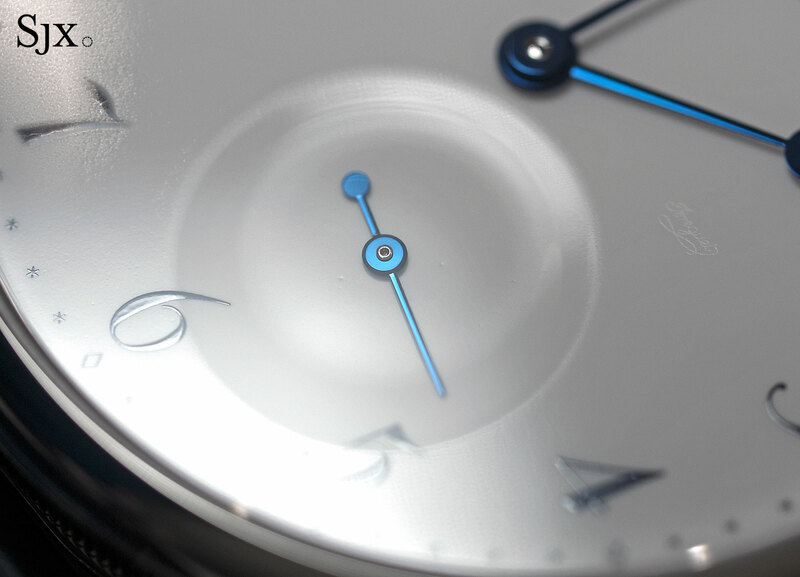 Despite the apparent simplicity of the new dial, it is gorgeous, especially in detail. The basics of the watch remain identical to the original guilloche dial version: a 40mm case that’s just 6.1mm high, giving it an elegant, flat profile. Like all Breguet wristwatches the 7147 has a fluted case band, along with narrow lugs soldered onto the case that give it a formal appearance. The style is familiar, as is the feel. 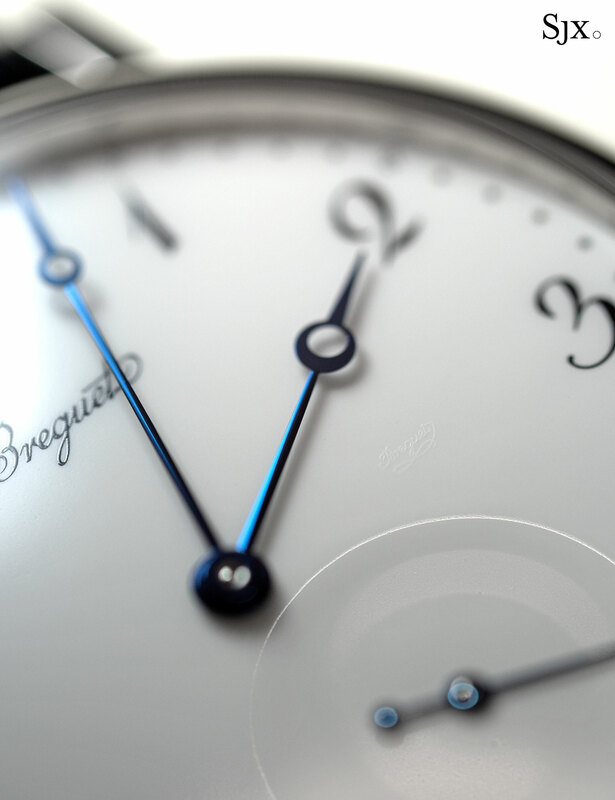 The vitreous enamel dial is typical Breguet, with Breguet-style numerals and hands. Though simple at a distance, the dial reveals whimsical details inspired by 18 century pocket watches. 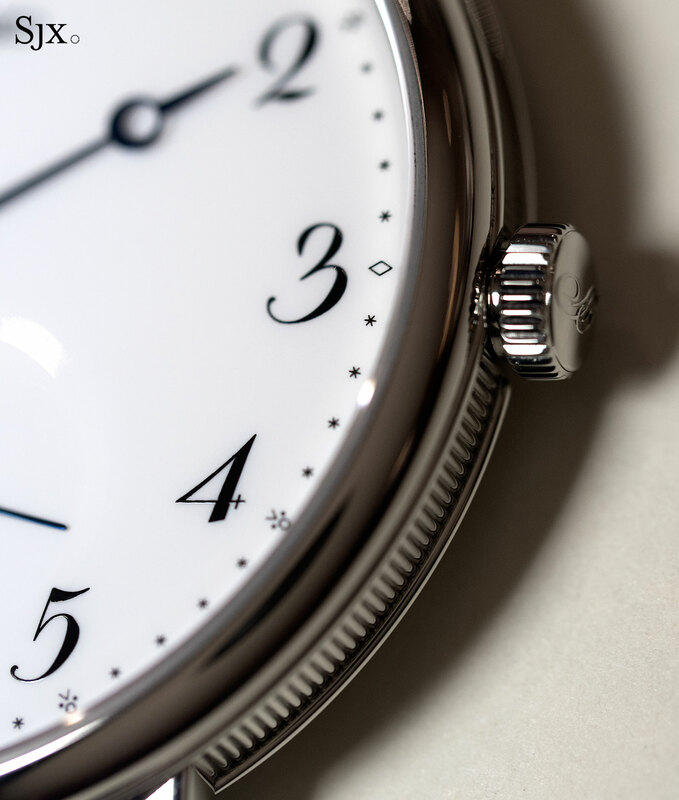 The minute track on the edge of the dial is comprised of tiny stars, with lozenge markers for the quarters and a combination of a sphere and delta in-between. Unusual as they are, the intricate minute markers are found on some vintage Breguet timepiece, including this quarter repeating pocket watch dating from 1786 that sold at Christie’s in 2016. 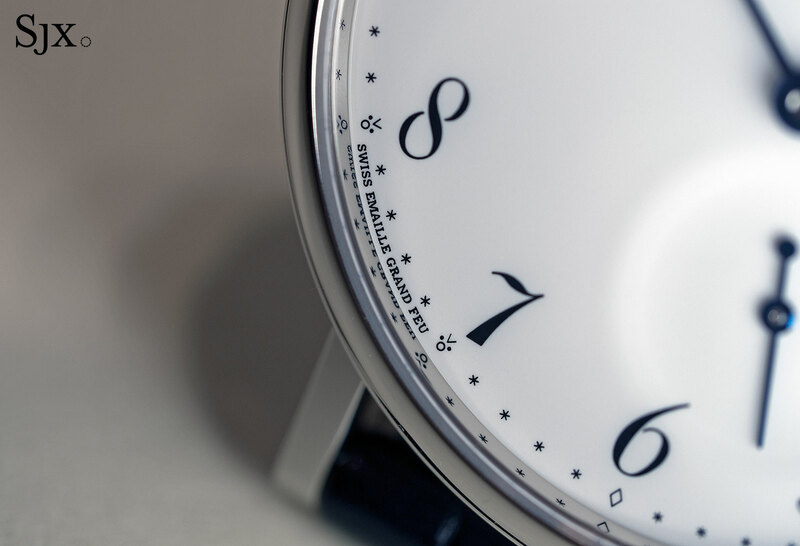 In the modern line-up, several models feature similar details on their enamel dials, including the immediate predecessor of the 7147, the Classique 5140. 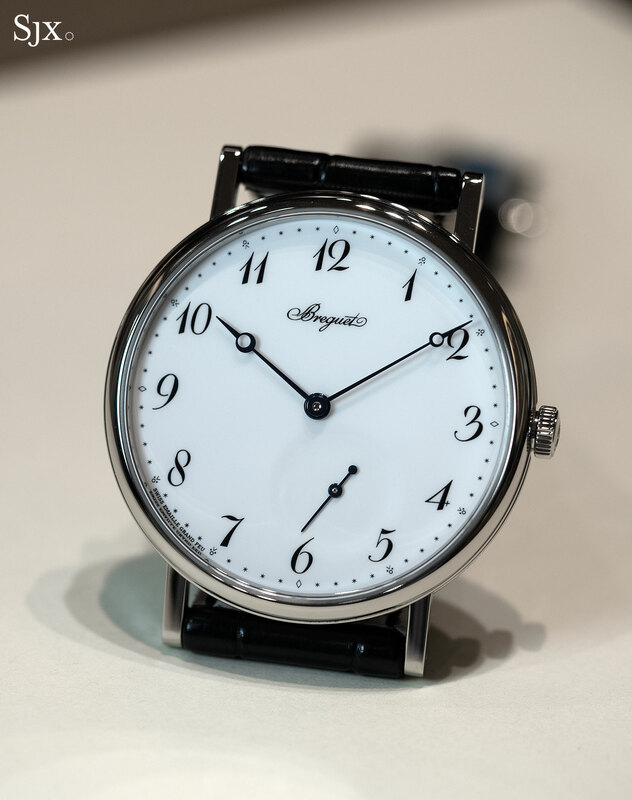 On vintage Breguet pocket watches enamel dials were doubtlessly hand-painted, while on the Classique 7147 and its contemporary counterparts the markings are printed in black lacquer. The printing, however, is finely executed and precise, successfully replicating the look of brushstrokes on the Breguet numerals. 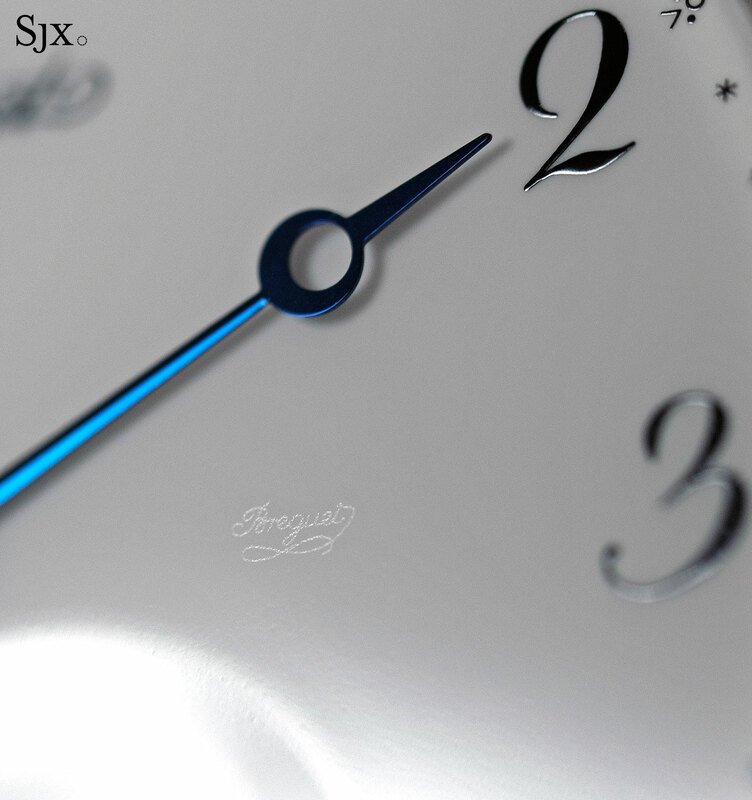 A detail that shows up only at certain angles is the “secret signature” that’s just beside the three o’clock marker. 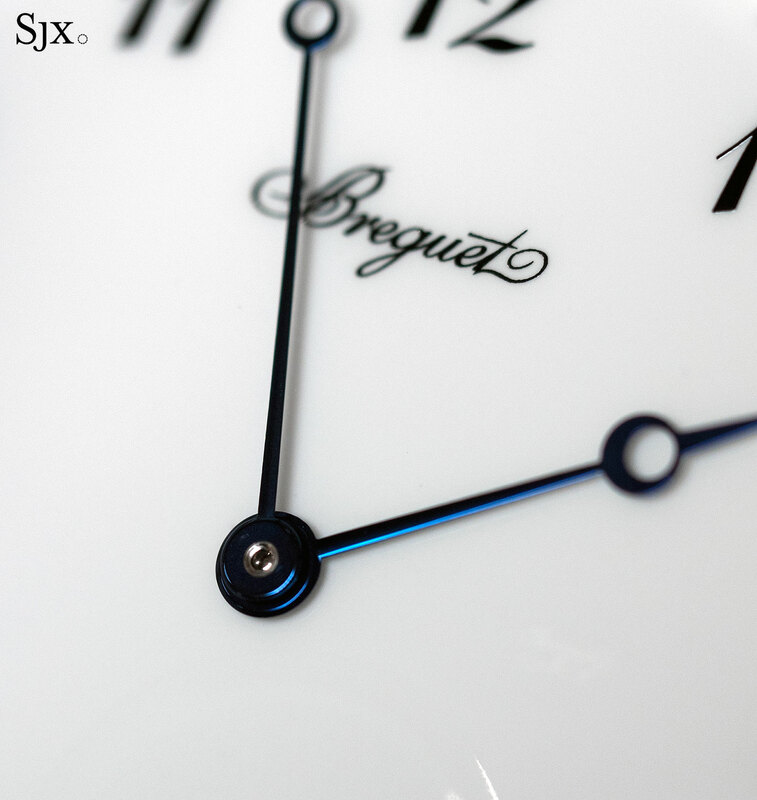 Originally developed as a mark of authenticity by Abraham-Louis Breguet for his oft counterfeited pocket watches, the secret signature is now found on all Breguet timepieces as a historical reference. Here the signature is finely and lightly etched on the enamel, rendering it barely visible. Equally subtle is the sunken sub-dial for the seconds. 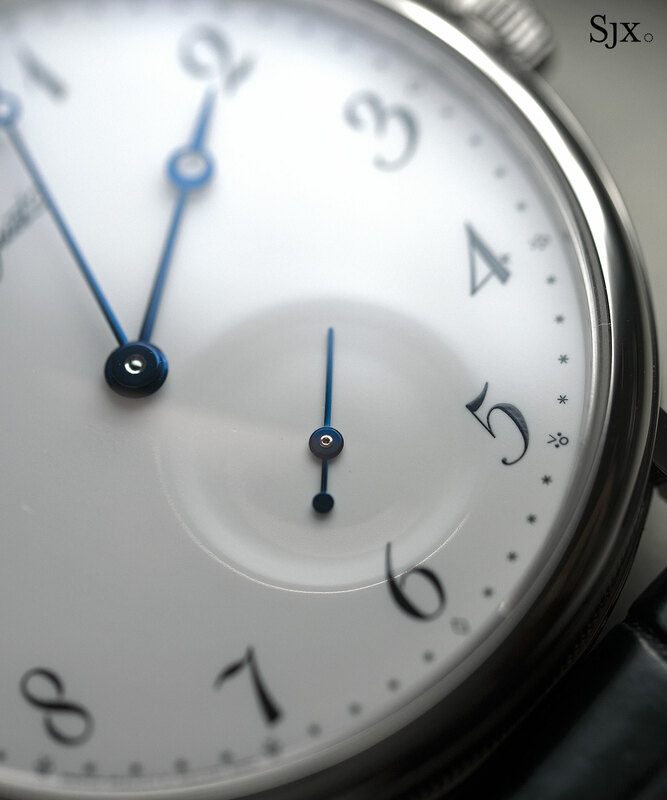 While on the first generation 5140 the sub-dial was a separate piece of enamel welded to the main dial, the Classique 7147 has a one-piece dial. 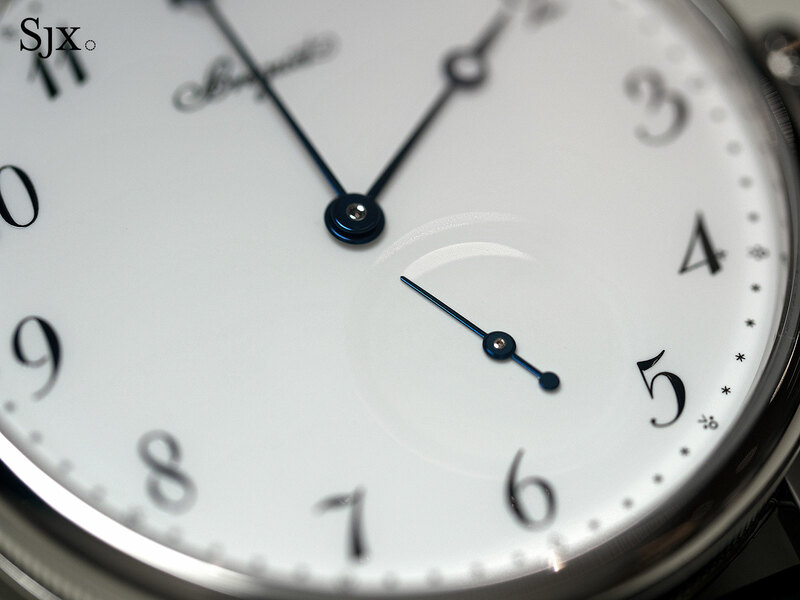 The sub-dial is faintly concave, gently recessed into the main dial, so gently, in fact, to be occasionally imperceptible. Just as it is beautiful the dial is also testament to the mastery that the Swatch Group has achieved over the process of making traditional enamel dials. 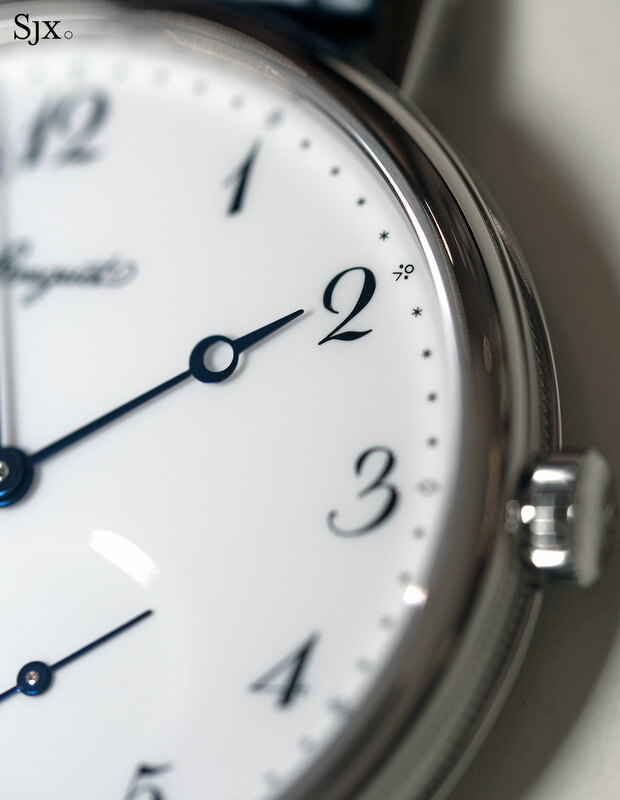 The one-piece dial also helps the aesthetics by preserving the hour numerals at five and six, which is not the case for a two-piece dial that requires the numbers to be cut-off to accommodate the sub-dial. 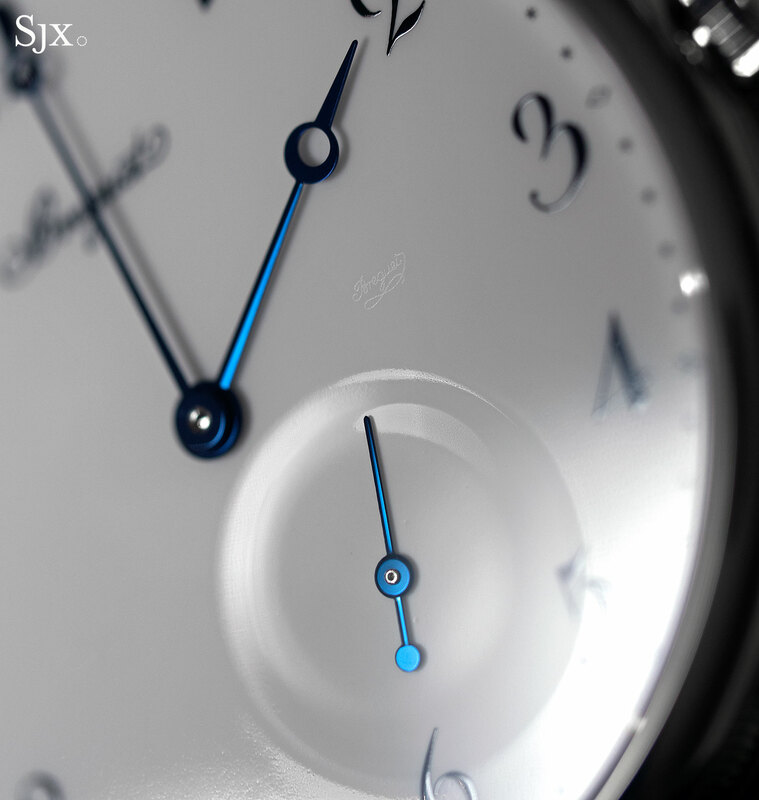 It’s a minor detail but perhaps the best thing abut the dial, illustrating the thought that went into the design. The Classique 7147 is powered by the cal. 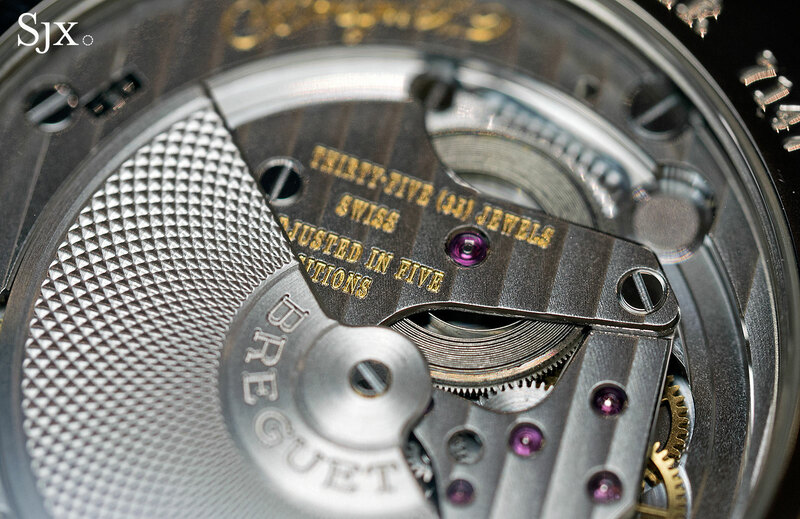 502.3 SD, an automatic movement found in several other Breguet watches. 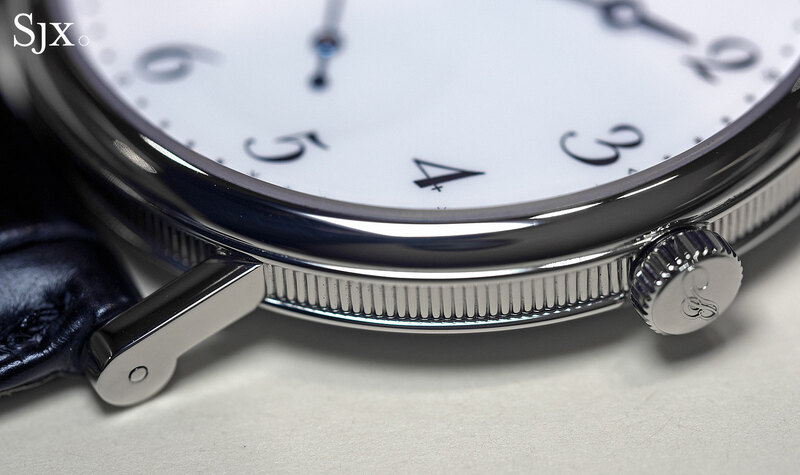 It’s a very slim movement, just 2.4mm high, that’s constructed in an unusual fashion. The rotor off-centre, and just below it the mainspring is visible thanks to an open barrel. 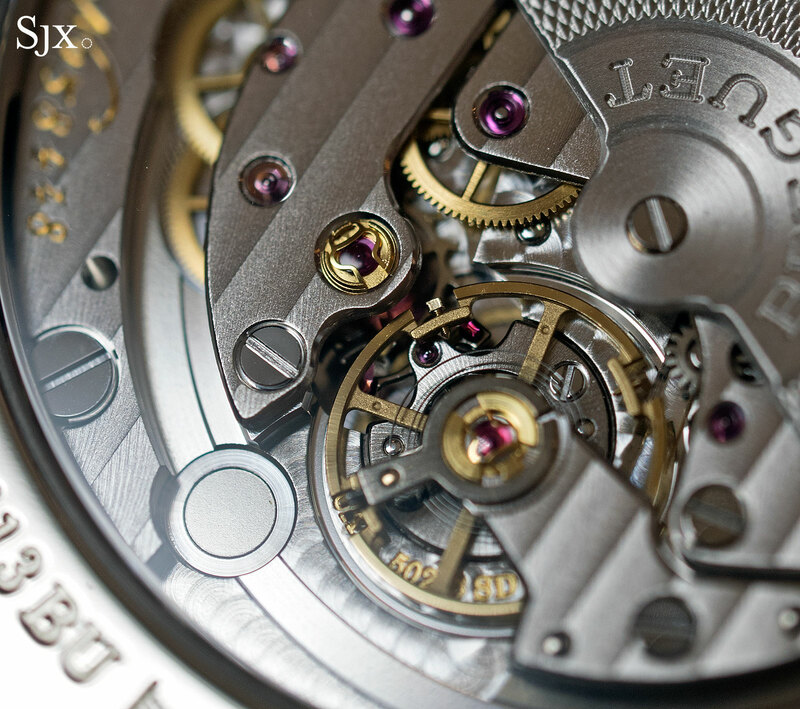 Together these features make the movement instantly recognisable. 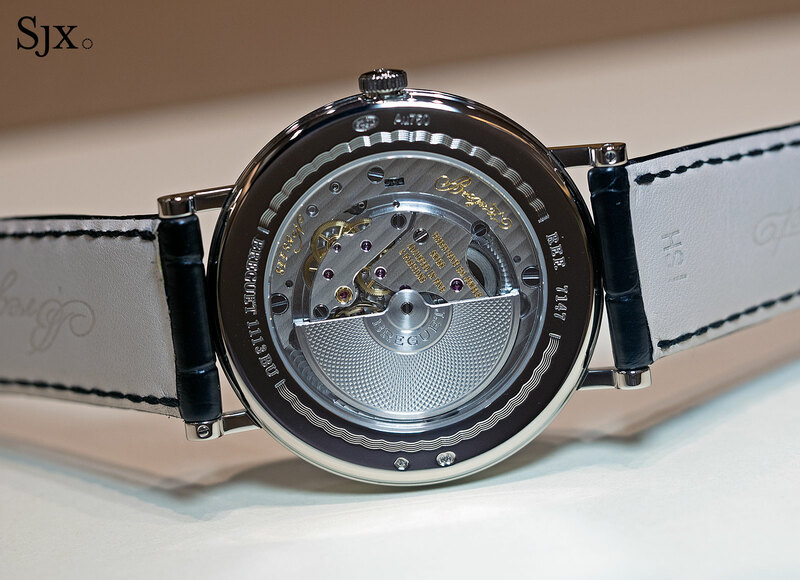 The movement has Breguet’s latest free-sprung, adjustable mass balance wheel as well as a hairspring and pallet fork in silicon, though the calibre is actually several decades old. It’s based on the Frederic Piguet cal. 70 (later renamed cal. 71), introduced in 1970. 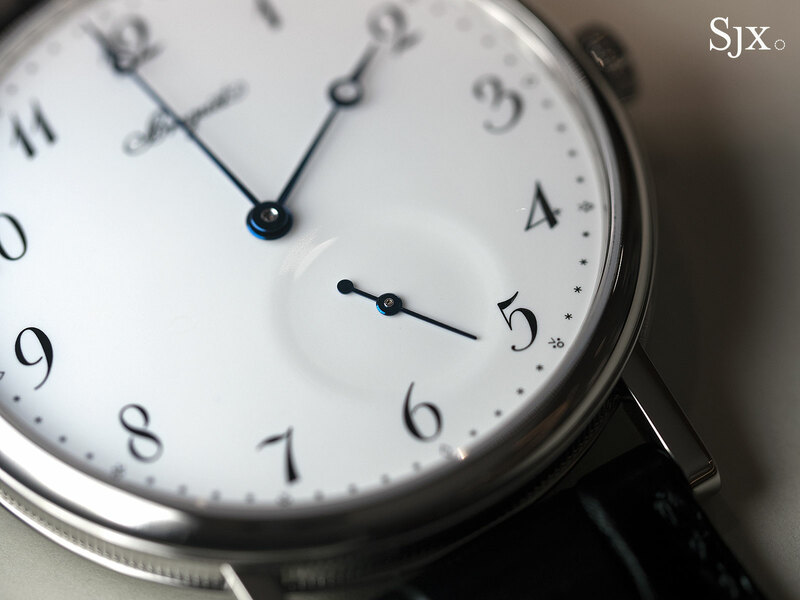 Once found in extra-thin watches produced by several brands, the calibre isn’t found outside of Breguet and Blancpain watches today, since Breguet’s parent company Swatch Group now owns Frederic Piguet. 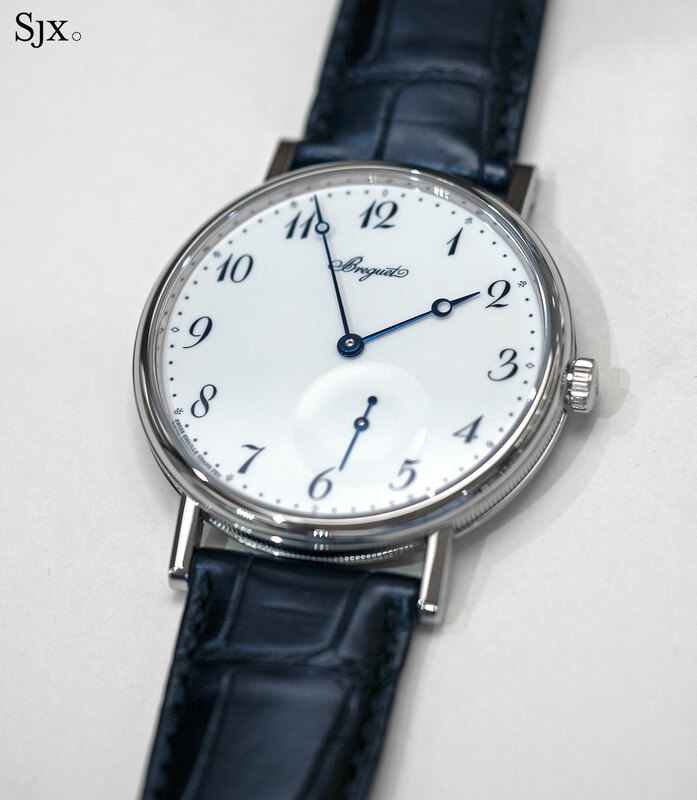 The Classique 7147 with an enamel dial is available in white gold (ref. 7147BB/29/9WU), priced at US$21,500 (or S$30,900 in Singapore). And in rose gold (ref. 7147BR/29/9WU) it costs US$21,000 (or S$30,200 in Singapore). Both cost exactly the same as the same model with a guilloche dial.